The Apostle Paul quotes this verse in Galatians 4:27. It predicts the salvation of the Gentiles during the rejection and dispersion of Israel. 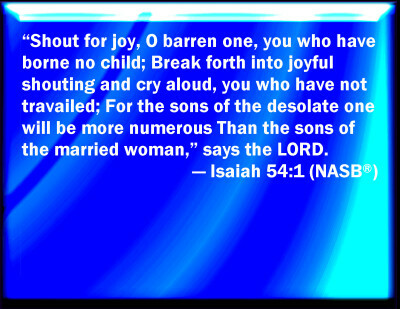 Paul quoted this verse to prove that more men will be saved under the new dispensation than under the old one, which is cast out and abolished. Before the Day of Pentecost and the arrival of the Holy Spirit on the relatively few believers following Jesus’ death and resurrection, the church was mostly in hiding, not sure of what to do next. Souls were not being brought to Christ. Once the Holy Spirit filled the Apostles and other believers, all that changed. Thousands of people in Jerusalem came to Christ, and persecution drove them out into the world where the gospel was spread quickly, and church were established all over Asia, into Africa, and in Greece and even Rome, where Caesar was the god to be worshiped. What a change! The power of the Holy Spirit remains with us today, and we need to learn to tap into it, to empower our witness, to continue to spread the gospel of Jesus Christ in whatever way we can. This verse means that God will account the Messiah among the great, and He (Messiah) will divide the spoils of the strong. The Septuagint reads, “divide the spoils of the strong,” referring to His mighty victory over Satan and all supernatural powers against God. If it does refer to dividing the spoils with the strong, then it means the He shares the blessings of victory with His followers who become joint-heirs with Him (Rom 8:17-18). He hath poured out His soul unto death refers to His blood being shed for all our sin. Always, from Adam and Eve, blood was required to cover sin; the blood of Jesus, however, cleanses sin. I seem to remember a while back that there was a controversy over whether Jesus shed ALL His blood, or just SOME of it. Please don’t get caught up in that kind of pointless debate. Satan loves us to divide ourselves over such arguments, and there really is no way of knowing. I forget why it was so important to some. The thing that is important is that He DID shed His blood to cleanse us from all our sin, and that He did have the victory over sin and death through His resurrection, without which there would be no salvation. I love the phrase He poured out His soul. . . .He was not made to do so, but chose to obey the plan of His Father, and willingly gave His life for us. 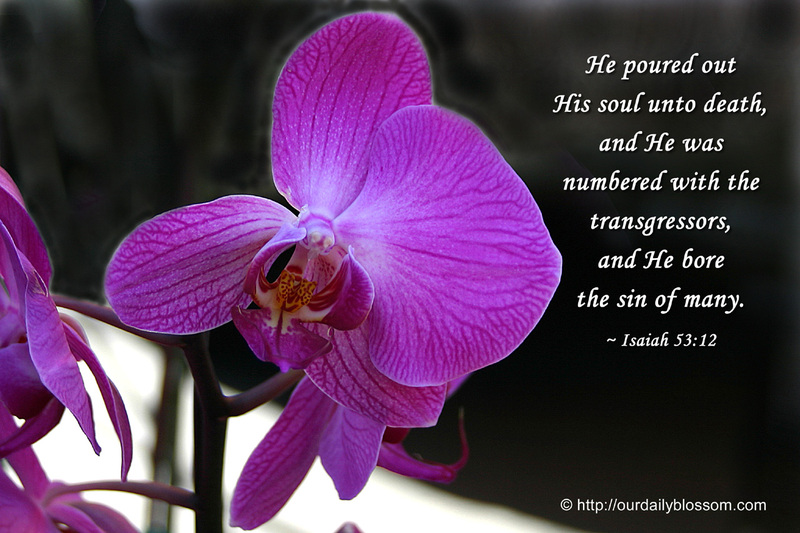 In doing so, He became sin for us, and so was numbered among transgressors, and made intercession for us with God. The travail, or anguish, of His soul was for the restoration of man and his dominion as before the fall ( I Cor 15:24-28). It is by the knowledge of God’s plan that mankind is blessed (Luke 1:77). The Messiah is called righteous because He did and always will do that which is perfectly right in all things commanded by God. It emphasizes His personal holiness ( I Peter 2:21-22). To justify means to declare not guilty. Faith comes by knowledge of the Word of God, and such knowledge will justify when obeyed (Rom. 5:1; 10:17). Jesus has born all our sin. He, and He alone, by the shedding of His blood and His resurrection, has made it possible for us to be reconciled to God. This is the last Sunday in October. The weather is cooling. I love it for sleeping, because I love to pile on the puffy comforters and blankets. We’re supposed to be getting a very heavy wind/rain storm, but so far it’s quiet out there. One more week of Daylight Saving Time, which it truly wish would go to its eternal rest. Soon it will be Election Day. I cannot urge you strongly enough to GO VOTE on Nov 6. Doing nothing is not acceptable. This is undoubtedly the most important mid-term election in our history, and whoever is behind the invasion from Central America has organized and timed it to hit our borders just in time for the election. No matter what President Trump does or does not do, the scavenger bird media will tear him to pieces. We need to pray for him. His position is anything but easy. The other thing I’m thinking about is the approaching holidays. I love Thanksgiving. I’ve held it here most of the time, but my failing back has made it necessary for my daughter to step up a couple of times. She’s an amazing cook, and it’s no trouble to go there, believe me! I just feel a bit lost that this part of my life is slowly moving into other hands. You never think it’s going to happen to you. Still, as I think back over the Christmases of my life, I find myself, in one small corner of my heart, a little unwilling to let it go to the next generation. Instead of being sad, though, I should instead be overwhelmingly thankful for all the wonderful holiday seasons of my 71 years, from the tinsel-covered Christmas tree of my childhood, to Christmases on the farm, to driving to South Carolina to be with my parents, or to Michigan to be with Terry’s—so many good memories, good times, good music, laughter, and activity. 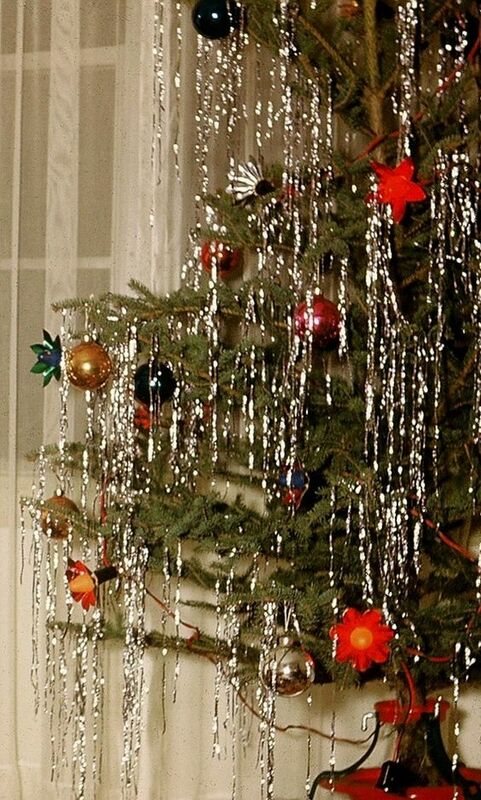 Remember when everyone put tinsel on the tree? I guess it’s considered tacky these days, which I don’t understand at all. I thought it was magical, and I miss it. Now, Terry and I are the old folks that the kids and grandkids come to see when they can. How did that happen? Where did the time go? And even more important, when did I become comfortable in this role? Every season of life has its own special joys and good memories, from our first Christmas as a married couple to our first Christmas as parents to a man who is now 48 years old; three more babies to follow, one born very close to Christmas. I hope he never felt cheated. We always had his birthday just as we did with all the rest. Those were the busy years, the hard-working years, the challenging years of rearing kids and making ends meet. And now we’re in what I like to think of as the reward years. Grandchildren are a wonderful reward. We love them all so much, and wish there weren’t so much distance between us. These are quieter years. We have our house to ourselves most of the time, and I like that. But I also love it when it’s full of family. Always, underlying the good times and the not -so-good times, has been our faith in God, and our dependence on Him through His Word, and prayer, and the preaching and teaching in our church. We have always tried, sometimes failed, to do what we believed was right in the eyes of God. We’ve had to learn to accept that we are not responsible for choices outside our realm of authority. Surprising, isn’t it, how hard it can be to accept that? It pleased God to bruise His Son? Let’s take a closer look. 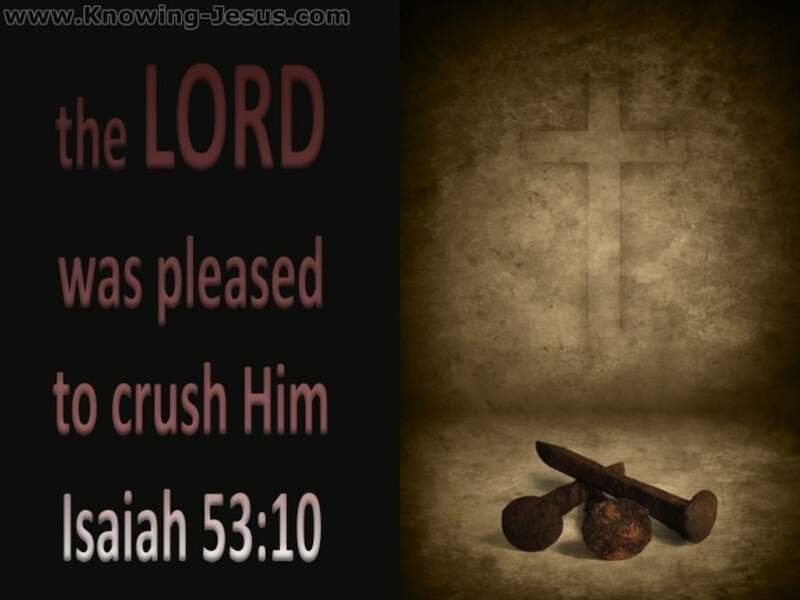 We need to understand that pleased does not mean God was enjoying what His Son was enduring, but that He was satisfied with the working out of His plan for the salvation of mankind. The only reason it pleased Jehovah to permit Jesus to be crucified was to bring the redemption of the whole creation so that His eternal program could be carried out with man on earth. He could not have been pleased with the mutilation of His beloved Son because He punished me for this (Acts 2:22-24; I Thess. 2:16). Both the Father and the Son volunteered to suffer such indignities for the salvation of men (John 3:16; 10:18). Such a sacrifice on the part of God showed His divine perfection, justice, mercy, and boundless benevolence. The law was upheld, sin was judged, and a basis of pardon and eternal reconciliation was made possible. He hath put Him to grief: The meaning here is to be rubbed or worn; weak; sick; afflicted; make sick; suffer a stroke; be diseased; have infirmity; put to pain; be wounded. Jesus was made sick when He bore our sins, took our infirmities and bore our illnesses. Jesus willingly bore all this in obedience to the Father; He gave His very soul as a trespass offering for our sin. The rewards of Messiah’s sufferings include the redemption of mankind, and the eventual return of the earth to complete reconciliation with God, under His hand–during the Millennial Reign. Jesus’ resurrection and renewed life would be eternal, because He is God and cannot be destroyed. This is completely personal and has nothing to do with much of anything, except that sometimes writing is cathartic for me; also, I wanted you to know why my normal post, which should have been Isaiah 53:10, will not appear today. I had a very bad night. I don’t know why this seems to happen when I have an unexpected and much-anticipated day off, but there it is. I didn’t get to sleep until sometime after three a.m., and was awake–against my will–shortly after 8 a.m. The lack of normal sleep set me up to be a cranky hot mess. We’re down to only one bathroom right now because Terry is renovating. So when I got up and saw that he was cleaning the only bathroom, my mood got worse while I waited. Isn’t that ridiculous? I’m very spoiled, used to having my own bathroom. Good grief. When our kids were still home, we managed SIX people with only one bathroom! Then I decided to work on a HUGE computer mess because of a program I installed for Terry that is massive and is blocking other applications. The more I investigated possible fixes, the more frustrated I grew. Felt like throwing things, to be perfectly honest. And then I pulled my Bible over to work on today’s post, and I sat there feeling utterly defeated. I couldn’t write it. I was upset, short of sleep, short-tempered, and knowing that I’m still going to have to tackle the computer issue. I got up and walked away, made coffee, fixed my breakfast, and played a round of Angry Birds while I ate. Go ahead and laugh. It made me feel better as I blasted those stupid pigs to kingdom come. Maybe my sour mood is compounded by a couple of sessions in my counseling office yesterday. I’m afraid I haven’t done a very good job of leaving them at the office. Frankly, I’d like to go do an Angry Birds-type search- and- destroy on a couple of people who don’t deserve to walk free. They belong in jail. For a VERY long time. And then I looked at an article about the invasion from south of our borders, and fueled my anger all over again. I need to stay away from that stuff today. It is so clearly being orchestrated and financed by someone other than the “immigrants” (read “invaders”) and timed to coincide with the Nov. 6 elections, that my blood pressure rises just thinking about it. And no, I’m not a racist or a xenophobe or any of the other popular names the Left likes to call people like me. I’m just wondering what Mexico or Nicaragua would do with 14,000 AMERICAN “immigrants” descending on their countries, expecting shelter, food, jobs, etc. Please. Okay. So you can see that I’m not in any condition to settle down with God’s Word. I need to get my own self back under the control of God’s Word before I can honestly handle teaching it to anyone else. So, do I feel any better, having poured all this out onto you? Actually, yes, a little. At least my stomach muscles aren’t all tensed up any more. And I WILL return to my usual sensible state of mind. I think I just need to do some serious repenting and praying. Anger is a terrible thing. 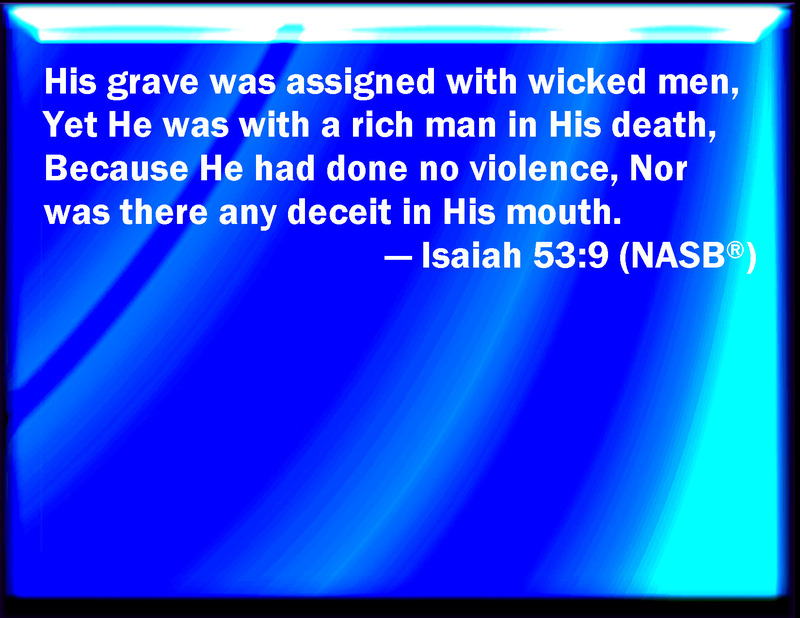 Jesus was buried at the same time as the criminals that died with Him, but His grave was a rich man’s tomb (Matt. 27: 57-60). In Jewish cemeteries, criminals were buried in a separate place from the others. The true meaning of the verse is that the Jews appointed Him a grave with criminals, but at the last moment Joseph of Arimathea, a wealthy man, begged the body of Jesus so he could put it in his own tomb, as predicted. The words He made in the Hebrew mean He was appointed. It was the Jews who appointed Him such a place, but when Joseph begged His body for burial this appointment was changed. Thus, the Jews even wanted to deny Him an honorable burial, but their purpose was defeated. He was rejected, crucified, and buried by men-not for any personal violence or deceit, but because of the wickedness and sin of those who slew Him. He was no rabble rouser or anarchist, and not injurious to any man. He sought to give life instead of taking it. He was accused of being a deceiver, and was treated as one, but He was always open and sincere in all of His words and deeds. No deceit was ever found in His mouth. His enemies acknowledged this (Matt. 22:16).